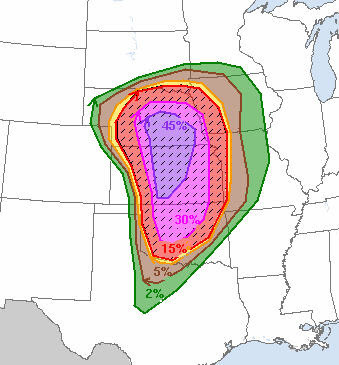 Tornado Alley will be given a chance to live up to it's name today as the Storm Prediction Center has placed a very large area from Nebraska to Oklahoma under a High Risk for severe thunderstorms, predicting a "significant outbreak of strong to violent, long-track tornadoes" for the region (see first graphic below). 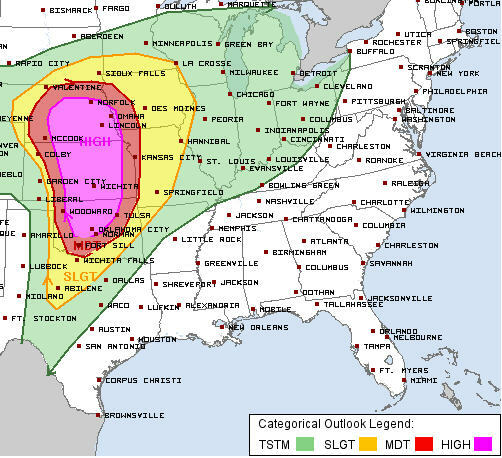 Several notable actions were taken in preparation for this event, including a very rare Day 3 Moderate Risk issued Thursday, a Day 2 High Risk issued yesterday (only once has this ever been done before), a Public Severe Weather Outlook from SPC (issued only when an outbreak is expected), and a 45% tornado risk area for parts of NE and KS (see second graphic below), meaning there is nearly a 1-in-2 chance of a tornado within 25 miles of any point within that area. The greatest tornado risk is this afternoon and evening, followed by the formation of a squall line over eastern KS and into OK this evening into the overnight hours. On Sunday, a slow-moving squall line is expected to move east from the Plains as a Pacific cold front begins pushing east. Low pressure moving out of the Central Rockies that is providing the necessary low-level wind shear across the Plains for tornadoes today will move northeast into the western Great Lakes Sunday, so a significant tornado threat is not expected further south, thus wind and possibly some hail will be the primary threats during the day from the Mid-Mississippi Valley into northeast Texas (see Day 2 severe risk graphic below). You'll notice that Sunday's slight risk area extends to just west of the metro. 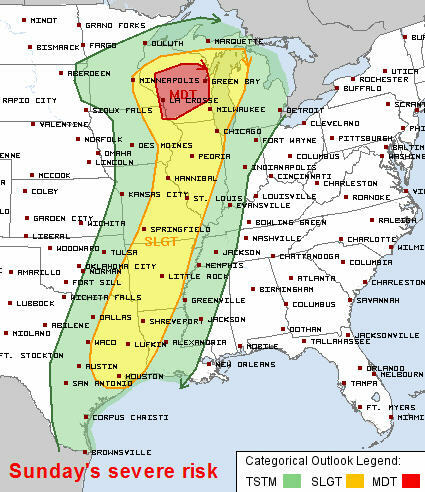 This is because the line of storms is expected to move east of the slight risk after midnight, when atmospheric conditions are least conducive for severe weather. I expect the line to weaken as it approaches the river after dark Sunday night and move through the metro before dawn Monday morning as a "general" line of thunderstorms. A remnant wind threat is still possible with the line, but the chance of severe weather is relatively low. The bottom line: while tornadic storms are likely in the Plains today, the storms become more of a wind producer as they approach the Mid-South Sunday and will weaken further as they enter the metro area early Sunday. Until then, we'll experience warm, humid, and windy springtime conditions, followed by more typical springlike weather in the wake of the front and for the first half of next week.